There are a lot of standards for Wi-Fi networks and how they should operate. The standards for Wi-Fi communication are always named beginning with “802.11” and end with different characters such as “a”, “b”, “n” or “ac”. Even though standards are developed by standards groups where experts from manufacturers and other organisations agree on how things should function a somewhat common problem with standards is that different equipment manufacturers might then not interpret the finalised standards in exactly the same way. This could prevent equipment from different manufacturers from working perfectly with each other. The stamp consists of the “WiFi” brand in the middle, surrounded by a bunch of characters representing which Wi-Fi standards that the product can support. The product has also been tested within Wi-Fi Alliance for those supported standards. So if you find two products such as a Wi-Fi router and a Wi-Fi network card for a computer and both have the WiFi logo which includes the “ac” label then those products will be able to communicate with each other. 802.11b is one of the oldest Wi-Fi standards. It supports a theoretical maximum throughput of 11 Mbps over short ranges using the 2.4GHz band. 802.11a is also one of the older standards. It supports much higher speeds, up to 54 Mbps, but over the 5GHz band. Back in those days when the 802.11a standard was first created the 5GHz band couldn’t really be used in most places of the world (it wasn’t yet an “unlicensed radio band”) so 802.11a didn’t become very popular back then. These days, however, the 5GHz band is vital to any newer Wi-Fi product, and 802.11a can be used as a fallback for newer standards if necessary. The most important information you can glean from the WiFi Certified logo is that if the logo contains the “a” label then you know that the product can communicate over the 5GHz band, which is a huge benefit. So keep a look out for that “a” in the WiFi Certified logo! 802.11g is the successor of 802.11b. It runs over 2.4GHz and supports up to 54 Mbps. 802.11n is a big upgrade compared to the previously mentioned standards. It is backward compatible with 802.11b and 802.11g and must support 2.4GHz communication. But it can also offer optional support on the 5GHz band and then also has backward compatibility with 802.11a. If a product supports both 2.4GHz and 5GHz communication it is called Dual-Band. 802.11n can utilise SU-MIMO with spatial streams to combine several streams into a higher total throughput speed, together with increased channel widths. Each stream can provide up to 150Mbps max theoretical throughput. Depending on the number of antennas that the devices have they can support 150Mbps, 300Mbps or 450Mbps throughput using SU-MIMO. The 150Mbps option is often a sign of a low budget Wi-Fi router because that option didn’t even exist when 802.11n was first created. It was added later to offer a cheaper option for consumers. Those access points that can only offer 150Mbps 802.11n often lack a bunch of other 802.11n features and should probably be avoided. There are two types of Dual Band when it comes to 802.11n. The cheaper low budget type is often called “Selective Dual Band” and means that you have to pick in the router configuration if you want it to use either only the 2.4GHz band or only the 5GHz band. This is bad because a lot of Wi-Fi clients only have support for 2.4GHz. That, in turn, means that you are more or less forced to select to use the 2.4GHz band, which deactivates the 5GHz band communication completely. The better type of Dual Band where both the 2.4GHz and 5GHz bands can be active simultaneously is the only one that can really be recommended. This is called “True Dual Band” or “Simultaneous Dual Band”. What this means is that the access point will actually run two wireless networks at the same time, one for each radio band. 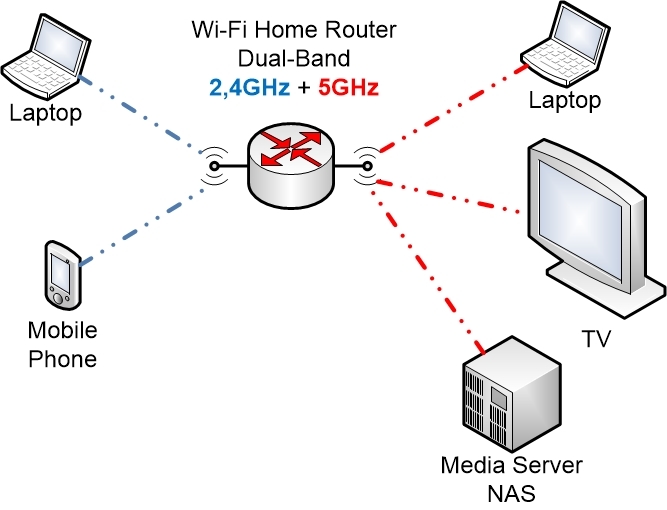 You could then connect laptops or tablets that don’t require much throughput on the 2.4GHz band while connecting your video game and your Smart TV for streaming media on the 5GHz band. The two networks will work side by side completely without interference between the two radio bands. A lot of manufacturers have started using a somewhat unofficial naming convention or rating for their products to clarify what the products can do and which transfer speeds that they support. The rating contains a number showing the theoretical maximum throughput that the device supports, and will also indirectly show if the access point supports simultaneous dual band or not. If you are buying a 802.11n Wi-Fi router then we would suggest buying one that supports N600 or higher. You would then get the benefit of getting a router with simultaneous Dual Band where you can use the 5GHz band for higher throughput. You might also look to the newer 802.11ac routers for even higher data transfer rates. The latest Wi-Fi standard (as of 2015-2016) is called 802.11ac. All 802.11ac devices are backward compatible with 802.11n. 802.11ac is very similar to 802.11n. 802.11ac is also built on transmitting one or multiple data streams that can be combined to increase the throughput. But whereas 802.11n can sometimes be limited to 2.4GHz communication only, 802.11ac requires support for simultaneous Dual Band. So buying an 802.11ac device is always a safe bet. The new increased transfer speeds of 802.11ac are only used on the 5GHz band. The data streams of 802.11n can transmit up to 150Mbps each. Devices compatible with 802.11ac can use streams on the 5GHz band that are up to 433Mbps or even 866Mbps in future iterations of the standard. That is why you can reach much higher speeds with 802.11ac. If one stream is used you can reach 433Mbps. Two streams equal 867 Mbps and three streams 1300Mbps. To reach those speeds, both MIMO and wider channels are used. The maximum channel width for 802.11ac is 160MHz. All 802.11ac devices must be SU-MIMO compatible which requires multiple antennas. Newer 802.11ac standards can also support MU-MIMO which lets them act more like switches, communicating simultaneously with multiple clients on the same radio channel. If you are buying new equipment today and are looking into getting the very best equipment, then you should look for 802.11ac access points with MU-MIMO support. Some of the higher numbered ratings in the table aren’t actually fully completed yet as of 2015-2016, so if you buy equipment with a higher rating than AC2350 then you are moving into unchartered territory. Most probably you are then buying equipment that is built according to the best guesses of the manufacturer as to how the final standard will eventually work, but since the standard might not yet have been tested within the Wi-Fi alliance against equipment from other manufacturers it cannot be guaranteed to work across devices from different manufacturers. Often when it comes to such new technology you have to buy all devices from the same manufacturer to be sure that it works as announced, and you might encounter limitations. 802.11ac has existed for a while now, and there are a lot of good equipment out there. The 802.11ac standard will also continue to improve for at least another year or two with new equipment and improved transfer speeds.